The demonstrators wore white t-shirts with ?? 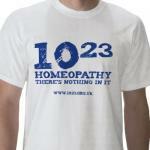 ?1023 Homeopathy: There?? ?s Nothing In It??? emblazoned in blue. One demonstrator, Athena, had blue hair to match. We assembled at the corner of Franklin & California Streets in San Francisco with a banner & leaflets to protest the marketing of homeopathic ???remedies??? by Whole Foods, CVS, Walgreens, and others. Similar and simultaneous demonstrations were taking place in 22 other cities on all seven continents around the planet. We passed out the small information leaflets, took pictures of each other, and chatted in uncharacteristically warm weather. Among the demonstrators were folk from The Exploratorium, the California Academy of Science, Atheist Nexus, Reason 4 Reason, East Bay Skeptics Society, two board members from the Bay Area Skeptics, miscellaneous skeptics, scientists, programmers, and students. At 10:23 AM, we all quaffed ???over-doses??? of homeopathic remedies ??? sort of. Since ???real??? homeopathic fake medicine costs ???real??? money and we don?? ?t want to support that industry, only a few drank homeopathic concoctions ??? the rest of us drank the equivalent: distilled water. 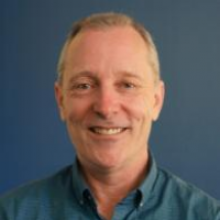 * * *After more photos, interviews for a media project, and getting to know each other, I headed back home promising to write letters to CVS, Walgreens, Food Mill, Whole Foods, and others who are profiting by this quackery. Special thanks to Jay Diamond, Norman Clevenger, and others for organizing this protest in San Francisco.